Welcome to the Ambassador League. We are elated that you share our passion to see the Church united and working together to build our Father’s house of prayer for all nations and to see Jesus’ gospel of the kingdom presented in power in your community or region. You’ve allied with us like an ambassador to represent (I like to say re-present) this strategy called 1Church1Day in your community. I cannot emphasize how very important you are to your community. No doubt you’ve been inspired by the results and want to see the same in your church, community or region. The key to transforming your area is….. God’s presence….. and the Church…. in YOUR area. I want to help you mobilize and connect the Church in your area which is made up of many local congregations and ministries. Here’s how we will help you. We will provide your league a special icon on our 1Church1Day map and encourage all in your local area to connect with you. We will train and support you through the training section of the app, my blog and if you choose, our Kingdom Academy. Here is where I recommend you start. Download the app if you have not already done so. Click here for the link to download on to your phone. Go to the Results section in the app, click map, or on the website and verify there is a green icon with the name and your email. Create a page on your website where you will post the decrees and prayer targets for your league. Send the link to us. We will add your Ambassador League to the Decree section of the app. Click Decrees in your app and you will see ten categories. The link to your league will be added to this section. 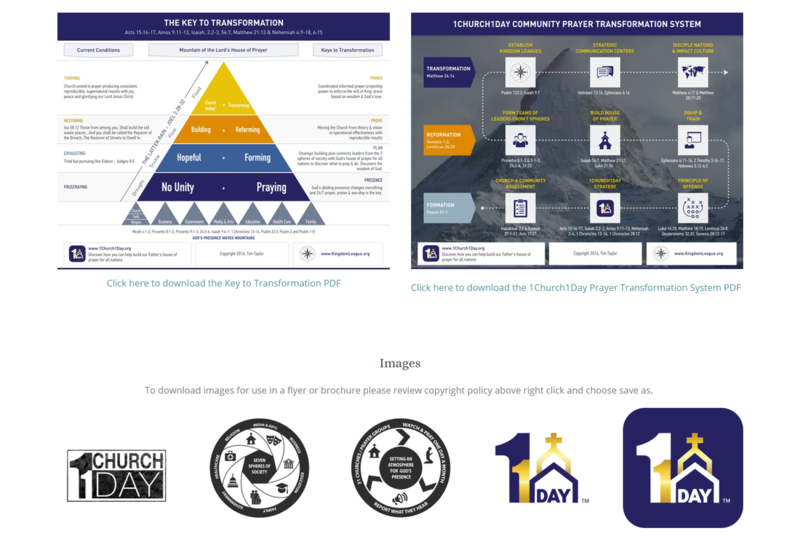 Review the 1Church1Day.org and KingdomLeague.org websites and become familiar with their tools. Review the audio & videos in the training section of the app. Take advantage of all the free videos and materials we provide on our websites and email or share on Social media and invite them to download the app and go to the Training section too. Visit our Free Tools page regularly as we’ll provide jpgs, files and templates to help you create brochures, flyers etc. Determine how you plan to share the vision. Will you emphasize the 24/7 prayer, support the people mobilizing National Day of Prayer and Global Day of Prayer in order to harness the momentum from those events, or you could begin by forming leadership (council) teams in the 7 spheres. Finally, you could do it all at once through a 1Church1Day Kick Off. Form councils who will help you develop prayer targets and decrees appropriate for your community/region. Have your league take a day each month to cover in 24/7 prayer and mark it in the Calendar section on the app. Please pray the decrees and prayer alerts and mark "I Prayed" when you do. As your ambassador league matures you’ll find other kingdom minded leaders in your community. Then you can use the assessment and begin to look at what our heavenly Father wants to accomplish long term in your area. It will help you and your leaders decide if a kingdom league would serve you and our Father’s purpose. Know that not only are you helping to build our Father’s house of prayer and connect the Church in your community but you are also uniting with the Church in your state, nation and internationally. Truly you will be “connecting locally while praying globally.” I’m honored that you’ve volunteered to partner with us and we look forward to co-laboring with you in this noble assignment. I pray you hit the mark for your destiny and our Lord’s glory that Jesus might be magnified and His will done in your area. I look forward to seeing all the marvelous reports that are produced through your league. I pray that even as you’ve allied with us that our heavenly Father will impart to you the same passion for His presence and the spirit of wisdom and revelation that He gave me that you might be anointed to mobilize the body of Christ in your assigned area. Build the Wall - a 52 day discipleship plan which this strategy is built upon. This will help you and your league build your wall of prayer. Developing Apostolic Strategy - the 8 major principles of war every leader needs to know. Operation Rolling Thunder - part of the history of 1Church1Day which offers many examples of how communities launched the strategy and the supernatural results that followed. Strategic Leadership is about the 8 principles of war authored by Yaweh Sabaoath. The Apostolic Reformation - examines how the Ephesians 4:11 gifts from the Son, the Romans 12:1-9 gifts from the Father and the 1 Corinthians 12:1-12 gifts of the Holy Spirit are being used to transform the 7 spheres today. Enjoy the sample MP3 below. This was used to announce the name change from Operation Rolling Thunder to 1Church1Day. Click here for Free Tools page! Download these PDFs and jpgs/png files to help you create your marketing materials.